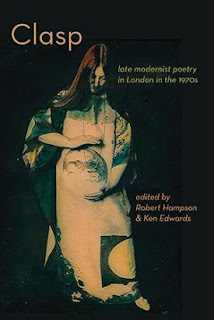 Just out from Shearsman Books: CLASP: late modernist poetry in London in the 1970s, which Robert Hampson edited with my help. Twenty-three contributors who just about remember the Seventies put their penn'orths in. The cover shows the redoubtable Paula Claire, who performed with Bob Cobbing and others. Available now from Shearsman or orderable from all good bookshops if any such are left.